Nestled in the charming hamlet of Jay, The Book & Blanket is your jumping off point for a multitude of all-season activities and adventures in the Adirondack North Country.Less than 10 miles from Whiteface Mountain, our home offers skiers a roaring fire and plenty of books to relax with after an exhilarating day on the slopes. Mornings bring hearty breakfasts, including home-baked breads, muffins and fresh-ground coffee. The Book and Blanket is just 17 miles from the bustle of Lake Placid and its Olympic venues. It is ideally situated in the Adirondacks on the east branch of the Ausable River, where fishing, swimming and hiking are literally a stone's throw away. Ausable Chasm, ferries to Vermont and Fort Ticonderoga are all easy day trips -- even Montreal is less than 2 hours by car. The Book & Blanket offers three spacious guest rooms, one with a private bathroom; two that share a hallway bathroom. Guests may choose from the Regency elegance of the Jane Austen room, the gentlemanly sophistication of the F. Scott Fitzgerald Room or the rustic comfort of the Jack London Room (pictured at right). There's also a James Thurber nook (Thurber wrote one of his short stories on a stay in Jay), an extra large porch (complete with swing), and an exuberant basset hound on the premises. But most of all there are books - in every room. Many of the books may be borrowed by guests "indefinitely". This means if you get interested in a novel, mystery, etc., you may take it with you to finish at your leisure. Perhaps on another visit you will leave a book of yours for another guest. 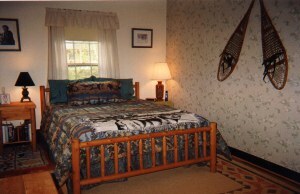 Jack London Room - private bath, queen-size bed. Jane Austen Room - large room with a queen-size bed and a twin daybed. F. Scott Fitzgerald Room - comfortable room with large reading chair and full-size bed. Children under 5 are free. $20 more/room for additional person. Plus NY State sales and bed tax. Call Kathy at 518-946-8323 for more information or to make a reservation. Click here to read the first half of the article. Click here to read the second half of the New York Times article. Read more about the Arts in the Adirondacks from host Kathleen Recchia by clicking here!